My holiday sewing has been going at snail’s pace. 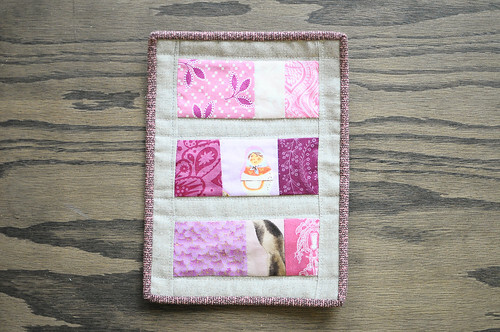 Last weekend I decided to download this pattern to make a patchwork mug rug. I’m sure a lot of you are wondering what a mug rug is. I only learned about them recently. 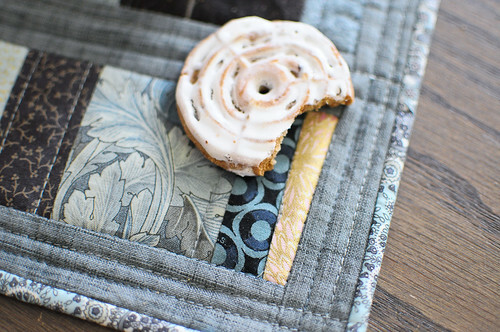 It’s a little coaster/mat for your mug with a little extra room for a cookie or yummy pastry. I think this is a brilliant idea because you gotta have a cookie with your hot tea! I have been coveting Amanda‘s mug rugs for ages. (this one! & this one!) So when I saw she had published a pattern for one, I knew I had to make a few. 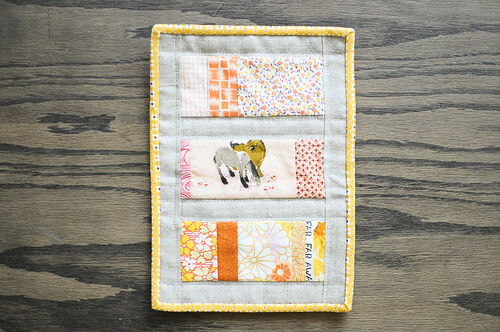 I had so much fun sewing up these little mug rugs. They were made almost completely from my scraps and leftover fabric. I made the first one for myself, to see how the pattern went and then made four more for gifts. They come together really quickly! 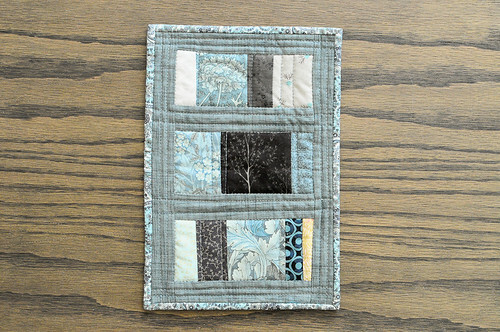 I can’t tell you how justified I felt using up some special wee scraps (some only a couple inches square) that I had been keeping in my scrap box. As you can see, this pattern is perfect for some choice fussy cutting. A great way to show off some of your favourite fabric details. I did very simple straight line quilting on these, echoing the patchwork lines. That’s pretty much what I do all the time. I need to get a little bit more creative in the quilting department! 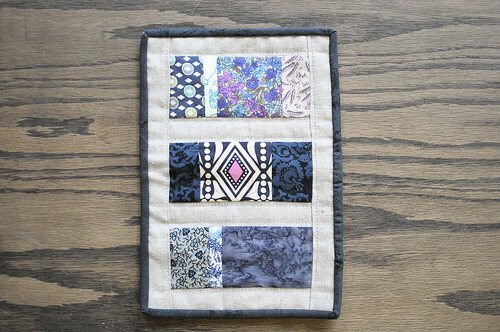 I am already starting to think of some New Year’s crafty goals and free motion quilting is one of them. 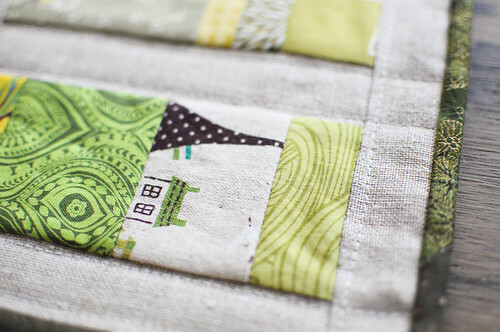 This pattern has really inspired me to start working on smaller patchwork projects. The same night after I made the mug rug tops, I stayed up and made my chromatic half log cabin. 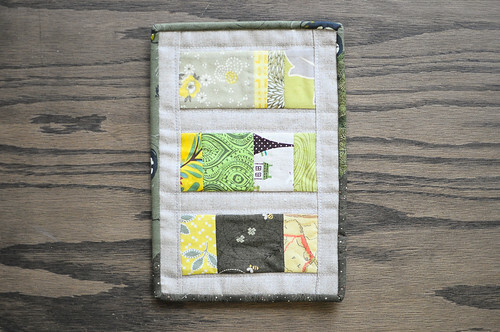 I gotta say patchwork mug rugs, mini quilts and table runners are where it’s at! You get all the fun of making patchwork and doing quilting, but it’s done in a day or two. The Venti Mug Rug pattern & other cool patchwork-y/cross stitch-y patterns can be found at The Frosted Pumpkin Stitchery. Eeek, your mug rugs are awesome! Great job Karyn! 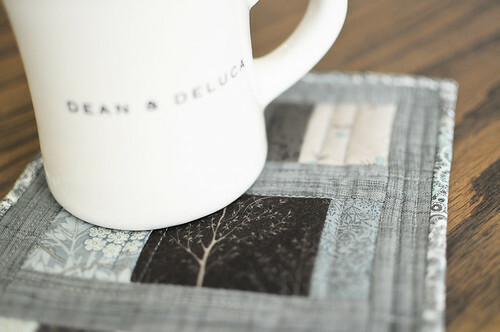 I haven’t jumped into mugrugs (I know, I’m practically the only quilter who hasn’t), but I’m a big fan of small projects like this: table runners, trivets, little pillows. I like the short time from idea to finished item. What a great idea for colleague gifts! And I always have small scraps of batting that aren’t good for much… but this is perfect! I made my first quilted table runner this fall and it is pretty satisfying to finish something so quickly (compared to a full-size quilt). These are so pretty! The colors really pop out fantastically. I can do this! I can make twenty of them! love these and especially the gray one you’ve kept for yourself, beautiful! Theses are lovely. The grey is my favourite. i love these. especially the grey one. they are on my to-do agenda for over the long christmas break from real work. Love these!!! Thanks for the link to the pattern. It’s a nice way to use scraps and make something useful.